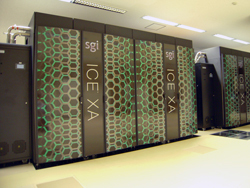 The Supercomputer Center (SCC) operates a supercomputer system available to all researchers of condensed matter physics in Japan. One can submit a proposal for a User Program to the Supercomputer Steering Committee, and once granted he/she can use the facility with no charge. 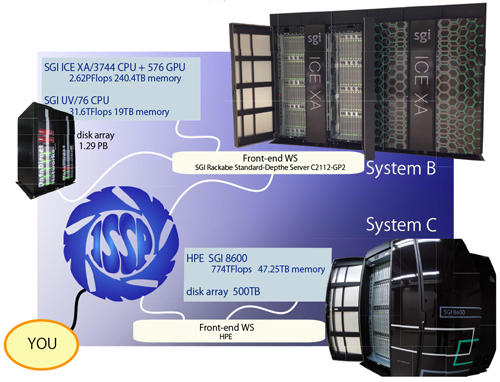 The supercomputer system consists of two systems: SGI ICE XA/UV hybrid system (3820 CPU (Intel Xeon) + 576GPU(Nvidia Tesla K40)) and HPE SGI 8600 (504 CPU). The former and the latter systems were renewed in July 2015 and in January 2018, respectively. In addition to maintaining high performance of the system in cooperation with the venders, the SCC also responds to questions and inquiries from users on a daily basis. In 2015, we started a new program for developing application programs aiming at more efficient usage of the supercomputer systems. We also support national projects, such as post-K computer projects, element strategy projects, professional development consortium for computational materials science (PCoMS), etc. software development projects. We support software development projects for post-K computer, Elements Strategy Initiative, and PCoMS by providing and managing computer resources. The Supercomputer System at the SCC-ISSP.